From swapping a small block Ford V-8 engine into an English AC Ace and creating the AC Cobra to building Mustangs into track-capable racers, Carroll Shelby is synonymous with high performance. His reputation for taking otherwise factory production cars and transforming them into performance legends was reversed when in the Nineties Shelby designed, engineered and built the Series 1. The hand-built sports car is the first Shelby built from the wheels up based on the collective knowledge that could only come from decades of performance success. 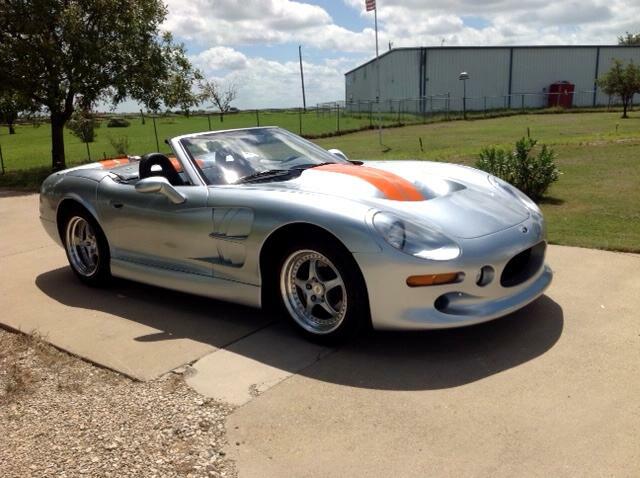 This V-8 powered 1999 Series 1 is one of just 249 cars produced and shows a mere 4 miles on the odometer. A naturally aspirated Oldsmobile 4.0-liter V-8 engine is set back in the chassis in a mid-front mount configuration for optimal balance. With dual overhead camshafts, sequential fuel injection and high flow dual exhaust the Oldsmobile V-8 produced 320 horsepower at 6,500 RPM and 290 lb-ft of torque at 5,000 RPM in Series 1 trim. The engine is mated to a ZF 6-speed manual transmission driving the rear wheels. An extruded aluminum frame is bonded with honeycomb aluminum panels to comprise the chassis. Race-derived double wishbone independent suspension works with pushrod-actuated inboard springs and damping for reduced unsprung weight. The carbon-fiber and fiberglass composite body is painted into silver with orange stripes punctuated by Series 1 badging and Cobra-style aluminum pop-up fuel filler cap. Retracting the top reveals a leather interior with bolstered power adjustable sport seats. Power windows and locks, air conditioning and an 8-speaker stereo system provide convenience, comfort and entertainment. Power steering, 4-wheel power disc brakes, and Shelby five-spoke forged wheels with UHP compound tires deliver confident road control. The Series 1 comes with Statement of Origin documentation from Shelby American, Inc., plus an owner's manual and limited edition jacket designed by Jeff Hamilton. As new never driven Shelby Series One 11 miles from new.